Trick-or-Treating is one the most common activities associated with Halloween. Children, and even some adults, love to dress up in costumes and travel around their neighborhoods visiting neighbors in search of treats. Kids love to gather up as much candy as possible in one night because it is one of the few times their mom’s do not say no. In some cases, even the family pets get a little taste of the treat, without the trick. Keeping your home safe for trick-or-treaters is just as important as giving out good treats. Home owners love to set up Halloween decorations and tables to hand out candy, but sometimes this places you at risk for being liable for injuries. Even though no one expects an injury to occur, this is not always the case. For instance, if an individual experiences an unexpected slip or fall while enjoying Halloween festivities in Florida; they might consider contacting a Tampa personal injury attorney firm or other Florida law group for legal advice. Regardless the city or state, if you experience an injury, it is a good idea to seek legal consultation on the necessary steps to take to resolve the matter. 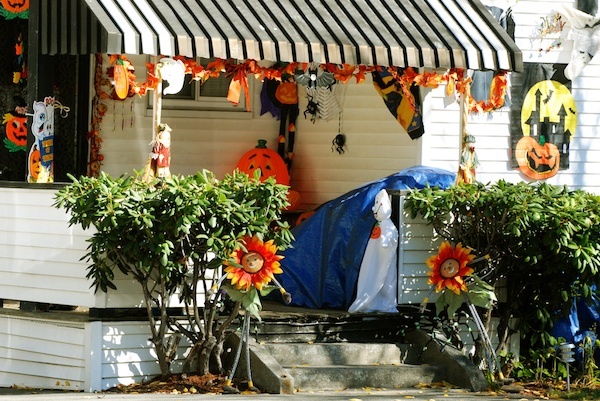 However,following a few simple rules will help you keep your home safe, and you free from liability, during Halloween. Make sure that all of your decorating is in your yard, garage, or on your home. Keep all your walkways free and clear of any decorations. Make sure that you sweep your sidewalks of any debris or leaves before the trick-or-treating begins. In the past, it was not uncommon for people to make cookies or popcorn balls to hand out to the children. This is not a wise choice to make anymore. The potential to be accused of passing around a virus, using products that someone could be allergic to, or people accusing you of placing something dangerous in the product is too great. Stick to sealed and prepackaged goodies to protect yourself from liability. Your dog may be the friendliest dog in the world, but the amount of chaos that surrounds trick-or-treating may be just the thing that scares them and causes them to bite. As a home owner, you will be held liable for any type of injury that your pet causes to a guest on your property. Halloween decorations are often associated with darkness to make them scary. While this is acceptable, make sure that your walkways are kept well lit so that there are no reasons that someone can trip and fall when they are getting their goodies. Many people like to set up a mini-festival at their homes to celebrate Halloween. Bounce house injures have become one of the leading causes of injuries to small children, and one of the largest liabilities to home owners. Avoid a bounce house as part of your celebration unless you make everyone sign a waiver. Halloween and fall harvest celebrations are something that most people look forward to each year. Many people see this as the last real celebration before the cold weather sets in. Others see it as a way just to have fun. However you see this celebration, it is always important to keep safety on your mind. Keeping your home a safe place for trick-or-treaters to visit will not only make you s favorite stop for the neighborhood families, it will also keep you free from being held liable for injuries that could occur. The last thing that you want during a celebration is someone getting hurt. Jamica Bell is a blogger and freelance writer. As a concerned parent, she contributes this article to help homeowners prepare for the Halloween season by putting safety first. Regardless of whether injuries are incurred as a result of a slip and fall or car accident, Tampa personal injury attorney firm, Williams Law Association, P.A. is committed to defending the legal rights of individuals who have suffered due to this unfortunate incident. My niece broke her arm in a bounce house. At least it was at her own house! Great tips, I’ve never seen anyone with a bounce house for Trick or Treaters though – I have to admit that would be fun (but true enough risky for the home owner in regards to injuries). Sticking to packaged goods is the only way to go. Keep the porch well lit and make sure nothing is in the way so nobody gets hurt. And make sure pets are indoors and away from the door. Good tips! We don’t get trick-or-treaters here. Maybe we will at our new house. Great tips! It’s dark and so hard to see at some houses. Good tips, but I will have to put my pets in my backyard so that trick-or-treaters don’t get scared when they come to the door. I’m trying to decide what to do with our fence..I don’t really want anyone trying to maneuver the lock and get in, but I love little trick or treaters…maybe I can set up something by the gate door? Thanks for the Halloween tips. I am hosting a Halloween party this year and was thinking of putting a pumpkin with a candle near the door but after reading your post I’m going to just move it inside for the guests to see or in the garden. Thanks! As much as I like the packaged candies they are so expensive esp when you are going to hand them out. It is a shame that now and days you have to stick to the pre-packaged kind unless you know the person very well. I love making my reindeer food (aka muddy buddies) for christmas and the one year I handed them out at my brother’s work. I love making my own goodies….I wish that I could do that for Halloween knowing that they won’t just get thrown out. 🙁 I understand why….it’s still depressing though. These are great reminders to keep our family safe this Halloween. Even though my kids are teens they still enjoy trick or treating. Thanks for putting these together for us. I think i live in the wrong neighborhood if people have bouncehouses! My biggest pet peeve while taking my kids Trick Or Treating is finding houses with actual candles lit and illuminating their walkway! It may look nice but it is a HUGE safety issue. Great tips! Last year, one of the houses we visited had a large dog out in their front yard. He was very friendly but definitely made it difficult to get to their front door. He held our attention for a little longer than we would have liked. I like pets but it would have been nice if they had let him run around out back or something instead. Great tips, especially about well lit houses. It can be a safety hazard walking up to the house if there isn’t any lights. Great tips. I always package my treats in little bags which I close with an orange or black ribbon and put an address label on the bag. I couldn’t agree more about keeping it well-lit. I know my yard has dips in it and such so I worry about kids tripping. I just hope they always go up the driveway and they do seem to do that these days. Whew. thank you for sharing those useful tips. Great safety tips! I always hated tripping over stuff as a kid and wouldn’t want my house to be the new hazard! These are some excellent tips. Although I’ve never experienced an injury during the halloween season, I can see how that may be possible. I also like the idea of packaged candy, although unfortunately, you just never know these days if your kids will get something bad. Sad but true. These are great tips! A well-decorated house is fun to look at, but I agree too much decor can get in the way and result in falls. Also, I always give out packaged candy – it’s easier and parents can decide whether or not their children can have it based on the label. These are wonderful, yet important tips! I totally agree about the bounce houses. After seeing a video of a gust of wind uprooting one full of kids and carrying it away I’ve been super paranoid about letting my son play in them. Great tips! These are great tips! Who would have thought that bounce houses were so dangerous! These are great tips! Sometimes I see cute handmade goodies that I’d love to give out for trick or treating but I never would for the reasons mentioned! These are such great tips, that will make for a way safer night! Some of these tips I don’t think everyone would think about ahead of time, so it’s great to have them on hand. Thanks! We always like to have it well lit. I always get nervous of houses that have it all dark. These are some awesome tips, thanks! These are some awesome tips. Great ideas! Especially sticking to prepackaged treats. No parent would allow their kid to eat something homemade, unless it came from a family member. I’ve never thought about the safety of others when I decorate but these are great tips. We love our neighborhood for trick-or-treating; the neighbors do a great job of creating a fun, save environment for everyone. These are great tips. Thanks for sharing. These are fantastic tips. I’ll be keeping them in mind when we start decorating. These are great tips! I can’t believe Halloween is almost here. Thanks for sharing these great tips, sticking to packaged foods is so important, especially for the little’s with allergies. You would think many of these tips would be a no brainer, but sadly some just don’t think. Hopefully they will stop at least one accident. Bounce Houses? I haven’t seen that in Oregon, mostly because it’s usually rainy and cold on Halloween here. I love to decorate for the holidays–especially Halloween–but since we have 13 steps to our door, I try to keep that area as clear and safe as possible. We just applied a great product that made our stairs non-slippery. Hopefully that will help improve our safety a bit. Great advice! It doesn’t apply to us anymore as we live in the woods 9 miles from town and trick-or-treaters are no where to be seen. But, we look for the things above when we take our grandson and his friends out haunting in town. These are some great tips. I don’t have any trick or treaters that come here. However, I feel that this would make my kids experience with trick or treating a whole lot safer. Thanks for sharing! Awesome tips, I will definitely share with friends.